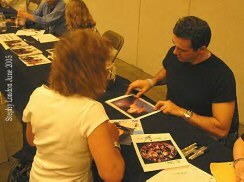 With a new "Highlander" movie currently filming, frequent set updates from Adrian, and a PEACE auction that just pushed the yearly total raised by PEACE to more than $100,000, we are all sharing in a truly exciting chapter of Adrian Paul fandom. Unfortunately, there are those out there who get their kicks from being sneaky and dishonest. Announcements have been posted to Adrian's website, the PEACE site, and Highlander WorldWide about recent FAKE AUCTION ITEMS on the Yahoo! Auctions site. The sellers claim that these items were donated by Adrian, and these claims are FALSE. If Adrian is going to auction off anything, it will be announced on the PEACE site. If you see an item up for auction that seems to be in any way suspicious, just send us an e-mail about it. Peter Wingfield keeps his Fan Club up-to-date with a few notes from the Highlander:The Source set. Be sure and read them at PWFC!! Reports from Adrian are coming in almost weekly from the set in Vilnius, Lithuania. HL producer Peter Davis. Click the logo above to watch the video. Check out the man in the red cardinal outfit.... Is it Peter or Adrian? Adrian, Peter and Jim Byrnes. "Little Chicago" was screened on November 4th at 7pm. In mid-November: HERETV! aired a "Making of Tides of War" special featuring behind the scenes interviews with cast and crew. We have our own Pictrure Pages for Tides of War...go Vist. Win a chance to be in the movie!! Win a phone call from Adrian! Follow the link NOW before it ends! To support Adrian's PEACE initiative, Davis-Panzer and Davis-Anderson have kindly donated the cost of the airfare (up to $1,000 U.S.) to match PEACE's donation of all meals and one night's accommodation to enable one lucky Highlander fan to spend 2 days on the set of Highlander: The Source in Vilnius, Lithuania. Added into this fabulous opportunity, the winner will also get the chance to make a cameo appearance in the film! The first day of the set visit is currently scheduled for November 12, 2005. During the 2- day set visit the winner will have the opportunity to see the film in production and to visit behind-the-scenes locations and production areas. Jim Byrnes and Peter Wingfield are confirmed to be there during this time. (be sure and check out our screen caps page!) Caution: adults only! Over 60+ items up for auction. Items up for auction not only include Highlander/Adrian Paul stuff, but also donated items from: The cast of Smallville, Adam Baldwin (Serenity); Charisma Carpenter (Buffy/Angel); Elvira; Stan Kirsch; Kate Mulgrew (Star Trek-Voyager); Jonathon Breck (Jeepers Creepers 1 & 2); Christopher Lambert; Peter Wingfield: Jim Byrnes: David Duchovney; and the cast of Young Blades. Plus more! For some History about Vilnius and the area check this site out. For some video clips of sites in the area check this site out. and the cast has been selected!! Be sure and check out their great site! For some 24/7 live-feed web cams in the Vilnius area, go here! HLWW just announced their Spring Equinox Tour of Scotland scheduled to begin the day after the Leeds Convention. March 13th-20th with Adrian as a special guest and guide for several of those tour days. So sign up now!! Recently,announcements about the new Highlander movie, "The Source"
have already started hitting the wire. great pics in this issue. 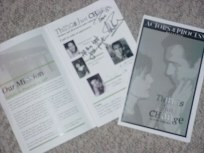 Adrian Paul Fan Club News!! is still much that needs to be done in terms of future sponsorships and fundraising. I need to be in a position where I can give that as much of my time and attention as possible - and still have a viable career. To that end I am pleased to announce that the Adrian Paul website and Fan Club are going to be revamped to more readily bring you varied content and easier access. With that in mind, we will be ending paid memberships to the fan club. This does NOT mean that the fan club is going away. It simply means that you will no longer have to pay to be a member. Adrian's Angels online E-group celebrated five (5) fantastic years online on September 24th. special years of fun, friendship and all the Adrian we can handle!! first film roles. He plays Billy James. 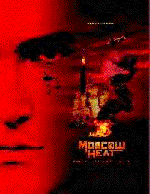 "Moscow Heat" coming to the USA November 8th!! Filmed in Russia, the fans have been waiting for this one. Check out our Moscow Heat page for more pics! to 22. It is their 11th anniversary. The film is set to be premiered on Sept 17th. Lizzie (Amanda) has a baby! She was born on July 28 at 1:50 p.m. 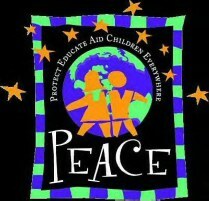 Weighing 8 pounds and 11 3/4"
(Protect, Educate, Aid, Children Everywhere) effort was opened online. VILNIUS, Lithuania (AFP) - British film-making company Katan Productions will start shooting the fifth movie sequel of the television series Highlander in Lithuania in September, the Lithuanian Film Studio production company announced. The movie, called Highlander: The Source, directed by Brett Leonard and starring Adrian Paul, is to be shot in the Lithuanian capital Vilnius, in the second largest city, Kaunas, and in Trakai, home to a medieval castle. "We do not doubt that the unique architecture of Lithuanian cities and the local countryside will help to create a special atmosphere," Christiano von Tippelskich, who will produce the movie, said. "The professional specialists at Lithuanian Film Studio will make not only original costumes and decorations, but also mountains," he added. Lithuania has no mountains, the highest elevation in the Baltic state rising to just over 300 metres (900 feet) above sea level. Some 120 people will be involved in the filming of the new Highlander, which is to last about seven weeks. According to Ramunas Skikas, head of Lithuanian Film Studio, said shooting Highlander will be one of the major projects at the studio this year. Adrian plays John Kincaid and it also stars Philip Akin who played "Charlie Salvo" in a few Highlander episodes. Adrian is NOT in the first season, so let's hope they put out Season 2. He only appeared in Episodes 7, 8 and 9 but if the Blooper Reel is included, then this is worth the money! LONDON - Lions Gate has picked up North American rights to "Highlander - The Journey Continues," the fifth film in Davis Panzer's "Highlander" franchise. Davis Panzer is planning three new "Highlander" features over the next two years, starting with "The Journey Continues," which will be directed by Bret Leonard and stars Adrian Paul. Adrian will also be executive producer. "No way Up" it's overseas title was aired on Cinemax/HBO in Asia. November 15 says Alexander Nevsky. Phantom Below--purchased by Sony Entertainment and will be out October-December 2005. Meanwhile, check out our Moscow Heat page and our Phantom Below page for pics and info. Deb Q (one of the moderators for Adrian's Angels) was announced as the winner of the Peace Online Issue #44 fiction contest. Her short story was selected by Doug Aarniokoski (director of "Endgame") as the winner. 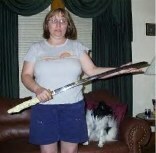 a replica of Duncan's Katana. You may read her story, click on her picture above! Adrian Paul & Duncan MacLeod..
"The new Highlander movie is going to start shooting sometime later this year in Eastern Europe. David Abramowitz is putting the final touches on to the script, and once approved it will go into pre-production later this year. I have always said that I would never do another one unless I had more control over the product. Well, this time I am executive-producing it. Brett Leonard (Lawnmower Man) is set to direct. Be ready to see a new Highlander film, one that has the quality of the television series with a new sound and look for 2006. Everyone is excited to be able to produce something that will revamp such a successful franchise. Once the rights fell back to Davis-Panzer after the demise of Dimension Films, Peter Davis approached me to star and executive produce. Watch here for more details as they are announced." 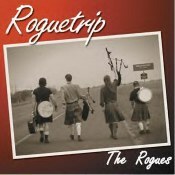 on their new CD "Roguetrip." The Rogues of Scotland performed at the Highlander Convention "Legacy 2000" and have appeared at numerous Renaissance Festivals around the world. Featuring EJ Jones (late of Clandestine) playing flute, and Jeremy Freeman (second place in the Silver Medal piping competition at the Northern Meeting in Inverness last fall) on the bagpipes. Thanks to Vicki for the update! Thanks to Kati for alerting us!! HIGHLANDER: The Raven Special Collector's Edition Set Featuring new and exclusive interviews with Elizabeth Gracen and Paul Johansson! Order now from Highlander-Official for early delivery before it hits retail stores. In the tradition of "Vampire Hunter D" and "Ninja Scroll," anime wizard Yoshiaki Kawajiri brings his unique visual bravura to the immortal "Highlander" franchise. For the first time, the MacLeod katana blade will find itself in the hands of a Japanese master. 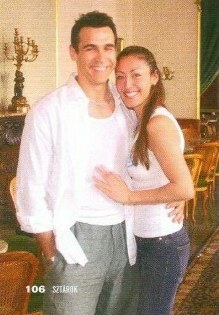 Adrian and Alexandra in Cannes! "The Children of Phi Phi Island"
In the aftermath of the Tsunami of Dec 26th, the children tell their stories of survival with words and pictures. charities The Phi Phi Island Relief Fund. on May 5th at the Westin century City Hotel. 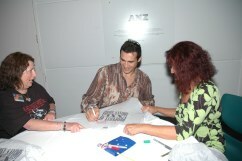 auction soon to help his Tsunami Relief effort! Adrian, along with fellow castmates Jessica Pennington, Juri Henley-Cohn and Marianne Ferrari performed April 5 & 6 and April 12 & 13 on stage at the Odyssey Theater (in Los Angeles) in a play written by Julie Osburn . Check out the new CTJ page! Those who attended say it was awesome! Write-ups by them will be appearing in the upcoming APFC/PEACE issue. AP talks about Season 6, the series and his work as a Humanitarian in an online magazine. "Charting new Waters in a Gay Role"
San Diego BUZZ featured Adrian on the cover and photos inside, along with a great article by Bill Bliss. the word out to TPTB that we think Adrian Paul is the perfect James Bond. A petition has been started, go SIGN!! Help keep Adrian in the #1 spot! Tides of War aired April 2005 on Here! TV! The reviews are in....it's great! info check out our Phantom Below page! According to Mark Sanderson, writer, the film will premiere and open the Hawaii International Film Festival (http://www.hiff.org) on March 31 at 8 pm in the Hawaii Theater. So, on pay per view channel -Here TV- it will be "TIDES OF WAR." Tides of War to air early April 2005 on HereTV! Actress Kelly Hu and actor Adrian Paul pose at the Jennifer Love Hewitt, Esquire Magazine and AIDS-Project Los Angeles 4th annual Oscar viewing party in Los Angeles February 27, 2005. Over $45,000 has been raised so far! Press Release was issued by Davis-Panzer on Friday 11th Feb.
West Hollywood, CA - February 11, 2005 - HIGHLANDER TV Series star Adrian Paul in collaboration with Davis-Anderson Merchandising Corp (DAMC), Davis-Panzer Productions (DP) and Highlander WorldWide (HLWW) have come together to raise funds for the devastated Thai Island of Koh Phi Phi. Koh Phi Phi, formerly renowned as one of the seven most beautiful places in the world by distinguished explorer Jacques Cousteau, and used in the feature film "The Beach" is now flattened in the rubble of the tsunamis of Dec. 26, 2004. Adrian Paul's brother Andrew had lived and operated an adventure travel business on this small island, a one and a half hour boat trip from Phuket, for over 11years. Andrew and the people, of the island now in ruins, need assistance to rebuild schools, homes and businesses. After learning that Andrew and his family survived, with nothing but the clothes on their back, Adrian Paul declared, "I wasn't surprised to hear my brother say that he wasn't going to leave but instead help rebuild the island's infrastructure. It was a massive job, and I was determined to help him any way I could." Adrian has turned to DP/DAMC to help organize a series of auctions to assist with raising funds for the rebuilding effort. The first auction will include original set costumes and props from the HIGHLANDER film and TV sets including Duncan's leather trench coat, a rare rubber katana and villains' costumes; personal possessions from Adrian Paul including the La Carrera Pan America race helmet, candid set pictures autographed from various cast, and individuallyframed photos; and HIGHLANDER collectibles from the Official HIGHLANDER Store. Every item and cash donation will includea thank you certificate signed by a combination of HIGHLANDER Creators and Producers Peter S. Davis & Bill Panzer and/or Adrian Paul. Peter S. Davis, DP/DAMC's CEO, expressed "When Adrian shared the miraculous survival story of his brother's family in light of such a terrible disaster, there was no question-we would assist in any way possible. How could we not?" 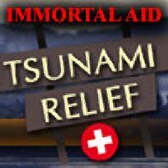 The first phase of IMMORTAL AID will commence with an auction on HLWW (www.hlww.org) on Monday, February 14th and continue through the Friday, February 18th. We are then looking to partner with additional auction sites to continue raising funds for IMMORTAL AID throughout the year. Bradford Film Festival March 4-19, 2005 at the National Museum of Photography. Special thanks to our correspondent, Ellina, in Russia who provided these awesome pics! "Parking your car will never be the same again" promises E5's trailer. Universal Home Entertainment will release "E5" In August 2005 and HDNet will premiere the film in January 2006 and James Seale is in discussions with one of the nation's largest theater chains for a limited release. who wish to remain anonymous, but deserve the praise anyway! SS..I could NOT do this without you!